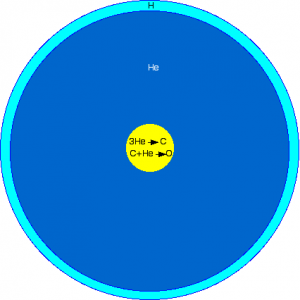 Not-to-scale schematic cross section of a hot subdwarf B star. Credit: Uwe W.
Two already-hydrogen-lacking white dwarf stars merge into one, with enough mass to re-ignite helium fusion. Such a violent collision event would tend to produce sdB stars that rotate rapidly. Two stars form together. When the more massive star expands to become a red giant, the companion is engulfed. During this common envelope stage, the conditions are “just so” to allow the red giant to eject a significant amount of mass well before evolving into a white dwarf. Generally, case (2) is considered most likely, even though the physical conditions needed to trigger this scenario are not fully understood. 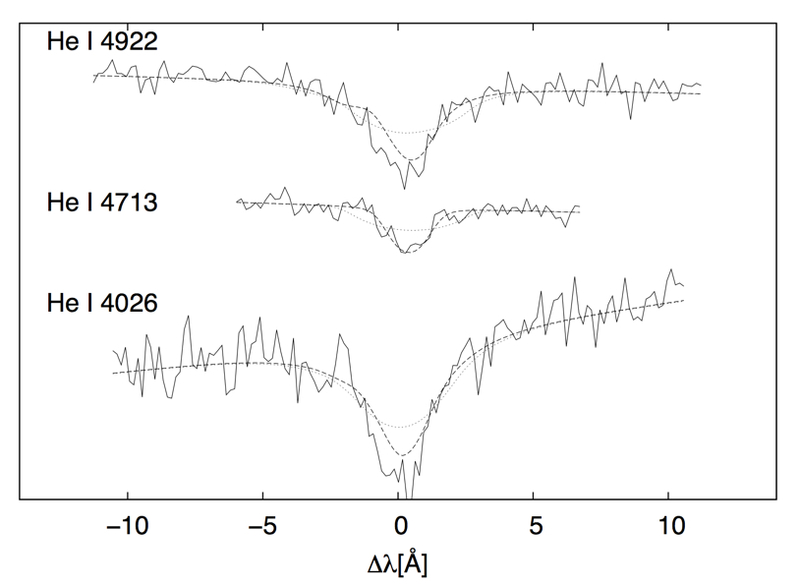 Observations show us that most sdB stars are slow rotators. And while it’s true that many sdB stars don’t appear to be in binaries, it is important to remember we can only detect binary stars in certain situations. It is also possible that a companion star could be destroyed during the common envelope stage. This sdB star has a friend! Astronomers love their acronyms, and the MUCHFUSS survey (Massive Unseen Companions to Hot Faint Underluminous Stars from SDSS) is no exception. Today’s paper reports a discovery from this survey: SDSS J162256.66+473051.1, an sdB star with a varying radial velocity, which indicates an orbiting companion. The authors followed up on the discovery with photometry and spectroscopy, which gave them a light curve and a radial velocity curve, shown below. With this information, they pieced together the story of this unique pair of stars. This binary system has an orbital period of just 0.0697 days, or about 1.7 hours. The sdB star is not big—it’s about 17% the size of our Sun, and half as massive. Still, it is roughly twice as large as its companion, and over seven times as massive! This means the companion must be a brown dwarf: a not-quite-star that has many properties in common with giant planets. Because the brown dwarf is too faint for us to see its radial velocity, the authors use theoretical mass-radius models for brown dwarfs to constrain both stars’ masses and radii. Radial velocity curve of the sdB star. The binary system was detected because its radial velocity changed relatively quickly. As the brown dwarf tugs on the sdB star, it causes the sdB star to move towards and away from us. This system has an orbital period of just ~1.7 hours. 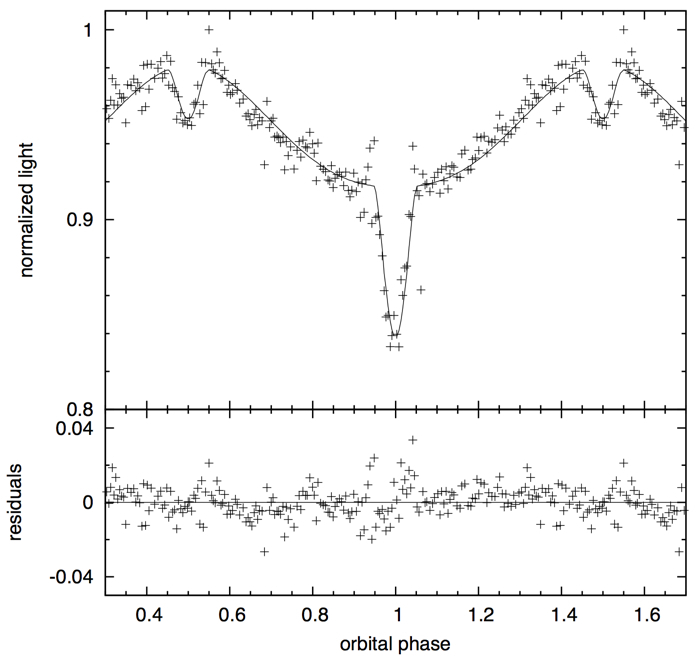 Light curve of the sdB + brown dwarf binary. At orbital phase 1, the brown dwarf passes in front of the sdB star, and at phases 0.5 and 1.5, the brown dwarf is behind it. The brown dwarf goes through phases, much like Earth’s moon, due to reflected light from the sdB star. This appears as the “reflection effect” which causes the system’s total luminosity to change between eclipses. Rotational broadening in three helium absorption lines from the sdB star’s spectrum. The solid line is the observed line profile, which is somewhat broadened due to the star’s rotation. The faint dotted line is the expected line profile if the rotation period equaled the orbital period. The darker dashed line is a much better fit and indicates the sdB star rotates more slowly than it orbits. This is the second known sdB + brown dwarf binary in a close orbit. The fact that these systems exist at all suggests that a low-mass brown dwarf is sufficient to trigger the binary evolution in scenario (2) above. However, there is a big unexpected result: this new system has not settled into synchronous rotation! 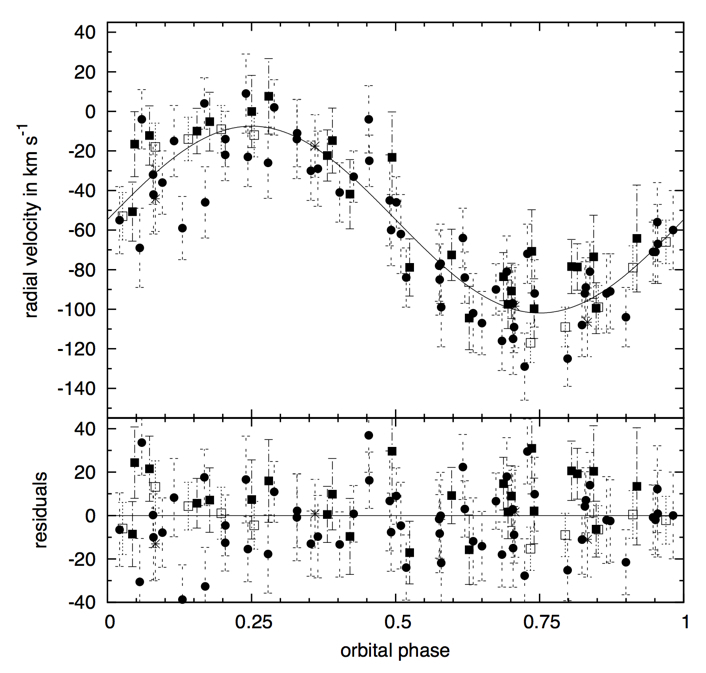 In other words, the sdB star is rotating more slowly than it is orbiting. Normally, we expect tidal forces to nudge both stars of a close binary into a lock-step dance that dictates one rotation for every orbit (1:1). By measuring the rotational velocities of prominent spectral lines, as shown to the right, the authors find that the rotation to orbital period ratio is more like 2:3. This is a less-stable configuration than 1:1, and raises the question of how such a binary could survive the “common envelope” phase necessary to create an sdB star in the first place.